Our About Us page explains that trash on the land in the 1,400 square mile watershed of the Haw River is washed by stormwater events into tributaries or directly into the Haw River. It may take years but eventually this trash ends up on the shoreline of Jordan Lake. Finally, we have direct evidence of our claim. 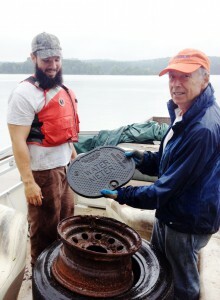 During a recent clean up by the Order of the Arrow of the Boy Scouts of America (see previous Blog), a thick, heavy plastic water meter cover was found. 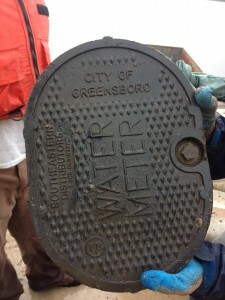 As the second photo shows clearly, this water meter cover came all the way from the City of Greensboro! The heavy rains from Tropical Storm Andrea in June most likely brought the water meter cover to the shoreline. This is possible to say because the very same length of shoreline had been cleaned in April by the NC Geocachers Org and a water meter cover would have been hard to miss. We are currently producing a 3-min video with funds provided by the Walmart Foundation that will help us to explain the trash problem to elected officials and staff in the 8 counties as well as public interest groups within the watersheds of the Haw River and New Hope Creek. It may take years to accomplish stricter enforcement of anti-litter and illegal disposal laws and more aggressive recycling programs but this is what we need to do to stop trash at its source. We also hope to produce a 20-second PSA from the video for airing by local TV stations. We want to educate all citizens upstream of Jordan Lake that littering and illegal disposal of trash harms the shoreline of Jordan Lake in many ways including damage to natural habitats, injury to wildlife, potential contamination of the water and diminished aesthetic value. Order of the Arrow, Boy Scouts of America Clean Shoreline Rain or Shine!